V-Mon is a powerful surround monitoring plug-in system for Pro Tools HDX and HD Accel systems. It can handle multiple inputs and speaker feeds up to 7.1 and is compatible with the TAC Systems VMC-101 remote controller. V-Mon is a powerful surround monitoring plug-in system for Pro Tools HDX and HD Accel systems. V-Mon flexibly monitors and meters up to ten 5.1 inputs, eight stereo aux inputs, four talk back inputs, and two listen back inputs. V-Mon provides extensive output control for up to four 7.1 speaker systems, one stereo downmix, eight cues, one stem meter for external hardware metering, and one stereo meter for external hardware metering. V-Mon provides four talk back busses for flexible global and individual talk back and slate communication. V-Mon provides two listen back inputs and outputs with cough control. V-Mon is compatible with the Tac Systems VMC-101 remote controller for convenient, hands-on control of the V-Mon system. V-Mon provides ten 5.1 stem-input plug-ins and aux input plug-ins that can be simply inserted on any mix, submix, recorder return, or other audio track you would like to monitor. These input plug-ins simply pass the audio through so your mix is unaffected while simultaneously sending the audio to the V-Mon monitoring system. Each channel of an input plug-in features gain trim and channel re-assignment for flexibilty in professional environments. V-Mon provides four speaker output plug-ins that can be configured for stereo or surround monitoring. V-Mon provides a volume control so you can connect directly to digital or analog speakers. Or if you prefer, you can set up V-Mon to connect to an external volume control such as Digidesign X-Mon. Delay and gain trims are provided for each channel for precise system calibration. Each speaker output has a delay mode setting up to 150 ms to compensate for video display latencies. And each channel can be delayed up to 20 msec for speaker location alignment. V-Mon features two stereo downmixers. The first is dedicated to monitoring and is used in two ways. First, it is used to feed stereo speaker setups and second, it is used to quickly check a stereo downmix while monitoring with surround speakers. The second downmixer is dedicated to downmixing the main stem mix for output to an external recorder or to a bounce. The downmixing equations can be configured in the V-Mon setup panel. The V-Mon Main Stem plug-in provides the main user interface to control V-Mon. All stem and aux inputs can be chosen in any combination using solo mode or sum mode. Each channel of the monitor bus can be soloed or muted. Stereo pairs can be soloed and routed to the front speakers. Downmix and mono buttons allow for fast mix checking. Each speaker output can be selected. The delay mode button will quickly enable/disable the delay mode setting of the selected speaker output. The LOCK button disables the volume control. The REF button quickly sets the volume to the reference level set in the setup page. The DIM and MUTE buttons are large and easy to select. The V-Mon Surround Send and Return plug-ins allow V-Mon to use external processing in the monitor chain. This allows a mixer to insert separate systems such as the Dolby DP570 or DMU. V-Mon provides four talk back buses. Three buses can be used for communication from control room to talent with up to four microphone inputs. The fourth bus is dedicate to Slate. V-Mon provides one listen back bus for communications from talent back to the control room. Two listen back inputs can be used and each has separate "cough" controls so talent can mute/unmute the input during recording and live broadcasting. V-Mon provides up to eight cue output plug-ins. Each cue output can select any combination of the eight aux inputs, downmix monitor out, track input, and four talk back busses. Each cue output has an adjustable 'dim' gain used when talk back is active. And each cue output has an adjustable output gain up to +10 dB. V-Mon is compatible with the Tac Systems VMC-101 remote control surface. The VMC-101 connects using RS-422 or USB. The VMC-101 features GPIO pins to integrate with other hardware. V-Mon is also controllable using the Pro Tools plug-in control surfaces such in D-Control, Command-8, and C-24. 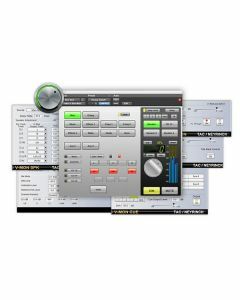 V-Mon provides a metering system unlike anything else seen in Pro Tools. V-Mon displays up to seventeen meter panels simultaneously where each panel can be one of the many surround and stereo inputs and output within V-Mon. V-Mon provides two meter output plug-ins so you can send any of the surround and stereo inputs and outputs to external metering hardware. V-Mon provides simultaneous peak and average metering with selectable VU and PPM response, selectable reference point, and selectable peak hold mode. Blu-ray DVD is making 7.1 surround the new standard and V-Mon is ready. V-Mon provides for 7.1 monitoring using either the SDDS mode or the DTS-HD mode that uses two back speakers. And when using a DTS-HD speaker setup, V-Mon can output the rear center channel of a LCRS mix or 6.1 mix to the two rear speakers and adjusted by -3 dB. Ten 5.1 Inputs or Six 7.1 Inputs. Four Speaker Outputs compatible with digital speakers. Extern Control using Tac Systems VMC-101 or Digi Control surface. 7.1 Front or rear layouts. Four Talk Back inputs and two Listen Back inputs. Four Talk Back Busses with slate. Listen Back outputs with cough control. Meter outs for external meter hardware. Monitor Send/Return for DMU / 570 Processing. Compatible with Pro Tools HDX and HD Accel systems. Mac OS X, Windows 7. HDX - Pro Tools 10.0 and later. TDM - Pro Tools 9.0 and later.